Salvador Felipe Jacinto Dali i Domenech was born on May 11, 1904 in the small town of Figueres, Spain, in the principality of Catalonia. Located in the foothills of the Pyrenees mountains, Figueres is only sixteen miles south of the French border. His father was a well known notary, and Dali spent many of his boyhood summers at the family's summer home located in the coastal fishing village of Cadaques. During this time, he was encouraged to pursue his artistic interests, and stayed many days with the Pichot family, themselves very artistically inclined. Dali's father saw to it that the young Dali had his own studio and that he had everything he needed. Most of Dali's early works show his intense devotion to, and love of, this beautiful section of Spain. Although most of his works during these early years are impressionistic in nature, Dali began to experiment with a variety of artistic styles at about the age of 13. His Catalonian heritage and upbringing would heavily influence both he and his ever evolving artistic style throughout his lifetime. In the early 1920's Dali studied draftsmanship, and then attended the San Fernando Academy of Fine Arts in Madrid. Never having been an academic wonder, Dali was at first somewhat an outcast. However, his early experiments with cubism gained him some notoriety amongst his peers, and in 1925 his father arranged his first one man show for him in Barcelona. In 1926, Dali was expelled from the San Fernando Academy for refusing to take his final, graduation oral exams. When asked to orate upon the subject of Raphael, Dali declared that he knew more about the subject than his examiners did, and thus refused to complete the requirements. Dali was permanently expelled and never received his formal degree in art training. Continuing his artistic experimenting, Dali received international attention, when his painting The Basket of Bread, now in the Salvador Dali Museum, St. Petersburg's collection, was exhibited in 1928 at the Carnegie International Exhibition in Pittsburgh. The year 1929 was extremely important to Dali for several reasons. First, he met his future wife, then Gala Eluard in the summer, and they instantly fell in love. Gala went on to become Dali's chief muse, lover, business manager, and partner in life. Were it not for the strong influence of Gala, who had very much been a muse for the newly formed Surrealist movement, Dali would never have reached the heights that he did. The other critical event for Dali in 1929 was his joining of the Paris Surrealist Group, which had been founded by the former Dadaist, Andre Breton. The Surrealists agreed with the Dadaists in acknowledging that logical reasoning and many other societal tenets had failed humanity, and that a more acceptable interpretation of the very nature of reality was called for. Dali soon became embroiled in the controversial art that was the mainstay of the Surrealists. This, and his marriage to Gala were the final straws that broke his relationship with his family. Outraged at his declaration that he "spit with pride on the visage of my mother" , and with the fact that Gala was still married to the French poet Paul Eluard; the younger Dali was expelled from the family home by his father. These events, and several others, would propel Salvador Dali into his great Surrealist period. Dali soon became a leader among the Surrealists, creating prodigious amounts of artwork in many media. His 1931 work Persistence of Memory is still one of the most well known of all Surrealist art. Although formally expelled from the Surrealist Movement in 1934, purportedly for his fascination with Hitler, Dali continued to create supreme examples of Surrealistic art for many decades to come. His response to his removal from the group was to say "Surrealism? I AM Surrealism!". Dali exhibited a number of Surrealistic art throughout Europe for the rest of the decade, often relying on member's of his infamous Zodiac Group for support. By the end of the 1930's however, Dali was becoming tired of his current style, and was again yearning for a new blossoming of thought, emotion, and genius. It came to him during another important period to Dali, that being the years 1940 and 1941. During this time, Salvador and Gala Dali fled to America from France, on a passage that had been booked and paid for by Picasso himself. Additionally, Gala convinced Dali that "his surrealist glory was nothing" and that he had new heights to achieve. Dali expressed his intense desire to become "classic" and soon embraced a new mesa of subject material, artistic technique, and genius. Dali began to focus on more traditional, and universal themes for his artwork, choosing the more objective focus over the former Surreal perspective. He turned again to more direct references of his Catalonian upbringing, to his mother's Catholicism, to a simpler and more secluded life in the foothills of the Pyrenees, overlooking the craggy rocks of the Mediterranean sea. Through out the 40's, 50's, and 60's, Salvador Dali was very much the avante garde artist he had always been. This was contrasted by a marked reclusive quality by which he and Gala would retreat back to Figueras or Cadaques, or Cape Creus, in order to escape the outside world. Dali created many wonderful works of art, among them the acclaimed Masterworks. Also at this time, Dali's most academic and voracious collectors were Mr. and Mrs. A. Reynolds Morse of Cleveland, Ohio. Over a period of nearly 40 years, starting in about 1942, the Morse's collected huge amounts of Dali work and media objects including oil paintings, watercolors, sketches, and original manuscripts. Other loyal collectors and media attention soon brought Dali the fame and fortune for which Dali had always yearned. In 1974 Dali opened his own Teatro Museo in Figueras. Many other international retrospectives followed throughout that decade. 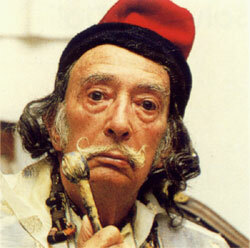 Gala died in 1982, after which Dali's health began to fade rapidly. He was badly burned in a fire in 1984, and spent the last few years of his life in relative seclusion in the apartments that he had adjacent to the Teatro Museo. After a pacemaker operation in 1986, Dali had but a few years left to live. On January 23, 1989, Salvador Dali, the greatest Surrealist painter of all time, died in the town of his birth, Figeuras, from heart failure with respiratory complications. One striking fact about Dali was that he was never limited to a particular style or media. Instead, Dali experimented with nearly all known media from sculpture to literature to painting. Dali's oeuvre shows a constantly changing evolution of style. From his earliest Impressionist works, through Cubist, Surrealist, and Purist influences, all the way into his Classical art, Dali continued to integrate a plethora of styles into his own work, creating a wondrous and eclectic whole. His appetite for creation was vast, and over the years Dali spawned a multitude of works from a vast array of media. Amongst them oils, watercolors, graphics, drawings, jewels, sculpture, his own writings, and many objects 'd art. From his earliest works to his most astounding achievements, Salvador Dali showed a genius uniquely his, one that was translated into the world of art for all to behold. There can be no doubt, Dali stands amongst the most acclaimed and talented artists of all time. His own vision and determination have set in motion an entire movement of thinking, and will continue to set high standards in art for many generations to come.